Smith Maritime recently hauled a barge load of equipment on behalf of CAT5 Resources to help rebuild cellular communication infrastructure in Puerto Rico following Hurricane Maria. 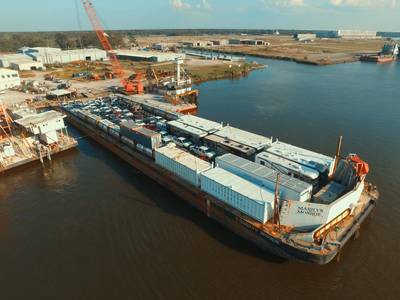 Smith Maritime’s barge Marilyn Monroe was loaded at its terminal in Amelia, La. with vehicles, housing, bulk fuel, food and most importantly, self-powered cellular communication towers to reestablish communication on the island. Marilyn Monroe was towed by the tug Elsbeth 2, powered by fully mechanical Mitsubishi engines supplied by distributor Laborde Products and rated 1,675 HP at 1,600 RPM each.